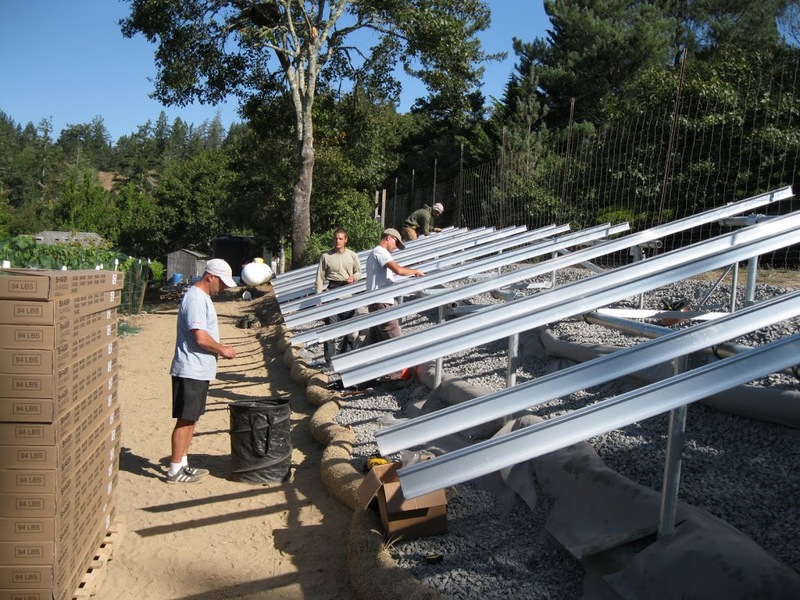 Installing the Bailey's Ground Mount - Synergy Solar & Electrical Systems, Inc. 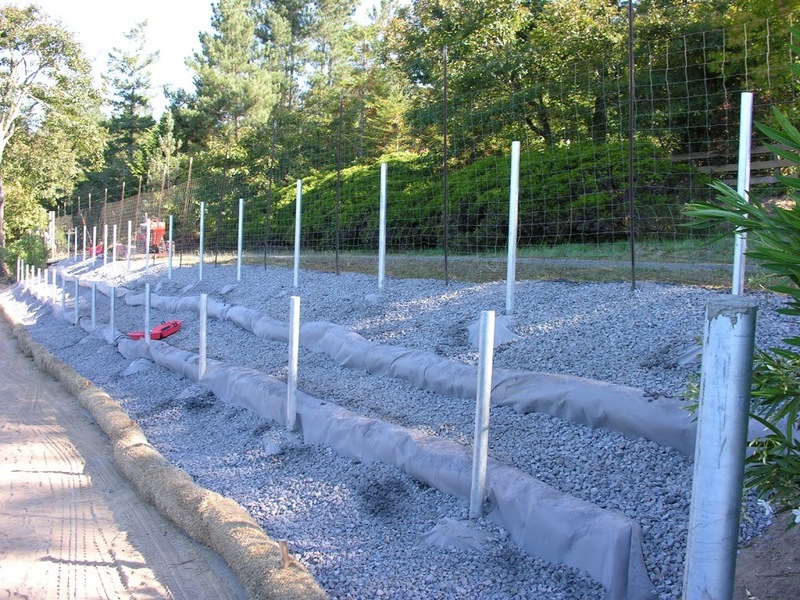 Ground mount system installations have more steps than systems mounted on a roof and can cost more. They have the advantage of easier access for cleaning, and energy production improvements since the angle and tilt are not dependent on the roof. The Bailey’s system offered a few unique challenges. The site had only one logical location for the array, which was along a vineyard row against the fence. The design had to leave room for trucks to pass on the road, and have minimal height so as not to impact the neighbors view. The design was a 3-up panel system built into the hill at the edge of the road. 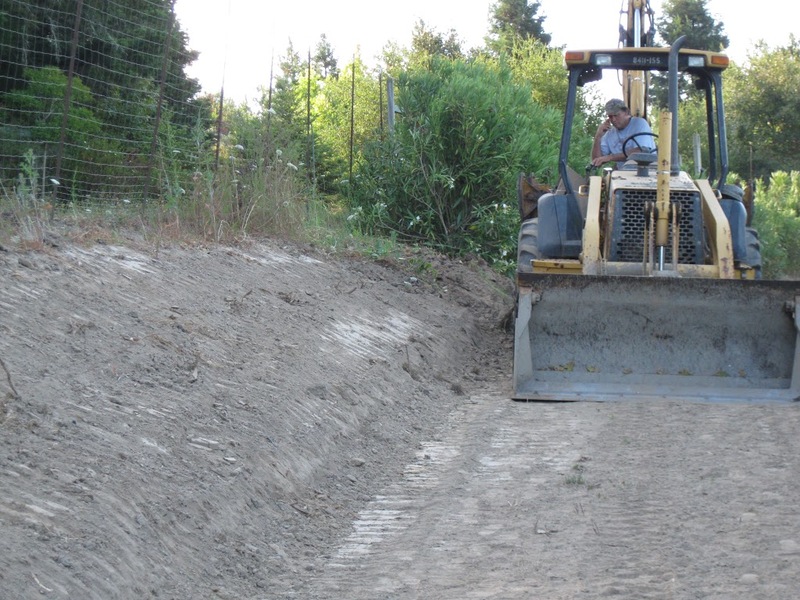 Below the grader is clearing the bushes and widening the road. 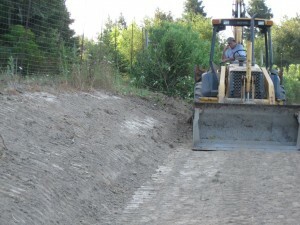 Once we had the spot cleared, the next step was drilling the holes and placing the posts for concrete pouring. Pictured below are Mike, Chaz and Gustavo aligning and bracing the poles. The next step was pouring the concrete. 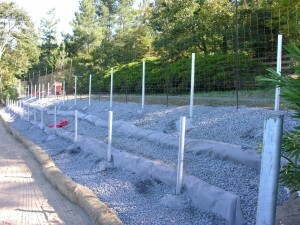 Once the concrete was poured the customer added weed cloth, waddle and gravel, to control weed growth below the array. 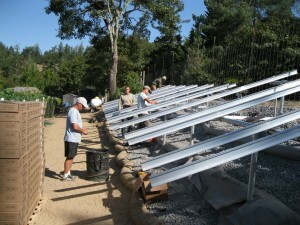 The next steps included cutting the poles to length, adding the horizontal poles, caps and braces, and finally attaching the rails which the solar panels will be mounted on. 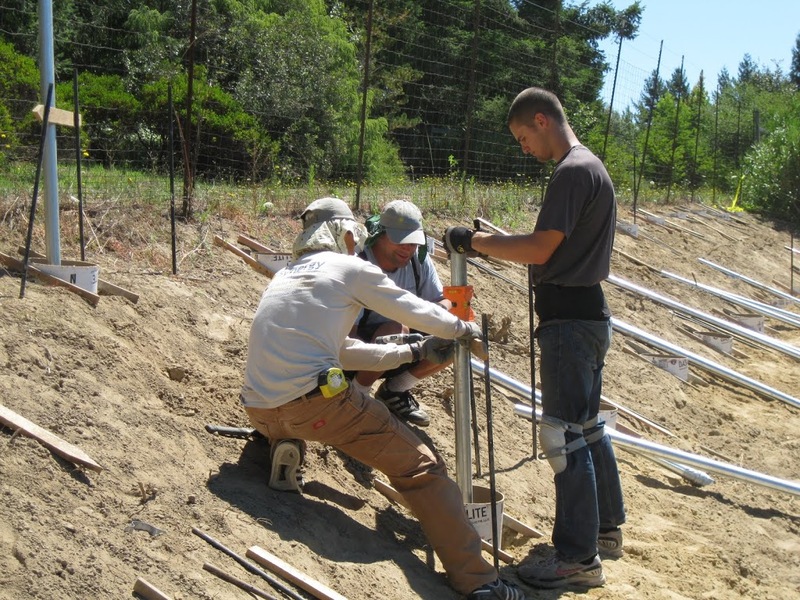 Here Mike, Conor, Chaz and Gustavo align the rails and put in grounding prior to panels being installed. And the final step at the array is mounting the panels. 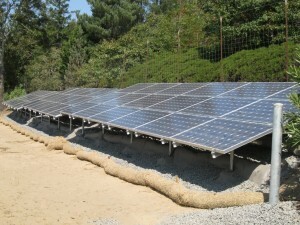 This 54 panel system (Sharp 240 watt panels) is made up of 3 arrays with 18 panels each, designed to step down with the terrain. 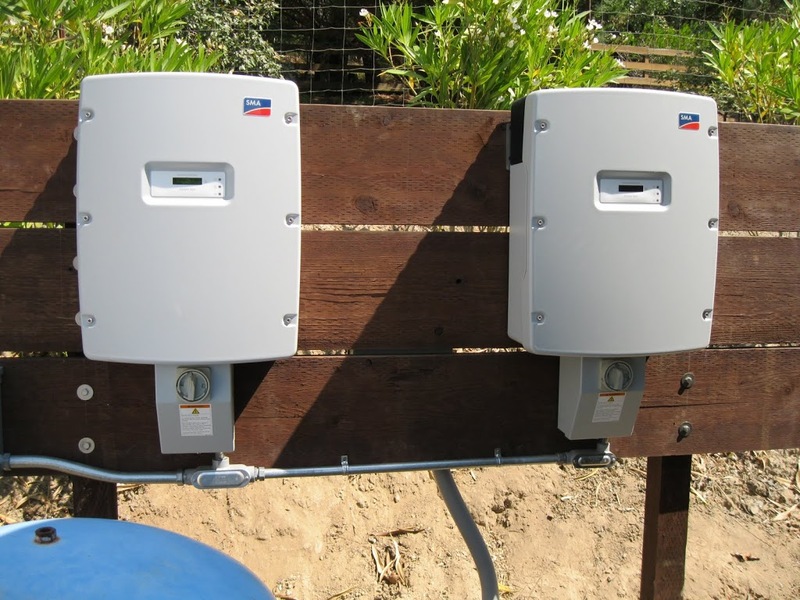 The final step was the electrical setup, which included 2 SMA inverters to convert DC power to AC power, and a new meter main to handle its increased load. Today, 9/14/11, is the final inspection for the Bailey system. 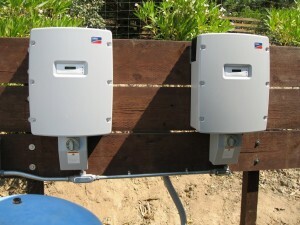 It will be producing up to 10.5 kWh of energy for the Bailey’s for many years to come. We try to keep it interesting.